Anglicare Victoria’s new program, The Buldau Yioohgen Youth Leadership Academy brings together community, cultural and sporting groups to support young Aboriginal and Torres Strait Islander people. The academy helps participants as they strive towards their educational, employment and leadership goals. Its name, Buldau Yioohgen, means “Big Dreams” in Wurundjeri language. The program is facilitated by The Long Walk and Anglicare Victoria and a range of community partners. It links young people with community Elders and provides them with industry and cultural experiences in partner organisations. 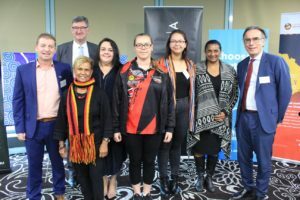 Anglicare Victoria Community Development Manager David Law said the program signifies the collaboration of organisations to offer the next generation of Aboriginal and Torres Strait Islander leaders’ guidance and encouragement to achieve their future goals. To find out more about the program, please call 1800 809 722. The Buldau Yioohgen Youth Leadership Academy facilitates and encourages young Aboriginal and Torres Strait Islander adolescents to realize their full potential as future leaders of their communities and gain a greater understanding of and pride in their heritage and culture. If you would like to make a tax-deductible donation to the program, please visit our donations page and put Buldau Yioohgen in the comments section.